The formidable-looking Red Stockings were on a roll. In the previous, inaugural season of the National Association, the Bostons, as the club was often called in the press, won eight of their last nine games to finish in third place (20-10), two games behind the Philadelphia Athletics. Player-manager Harry Wright’s squad began the 1872 season by playing their first seven games on the road, trouncing their opponents by a cumulative score of 98-23. Their only loss was to Philadelphia, 10-7. After finishing in fifth place (16-17) in the nine-team NA in 1871, the Mutuals (5-2) seemed like pennant contenders. Led by player-manager Dickey Pearce, they had won five in a row before losing to Boston, 9-2, at the Union Ball Grounds in Brooklyn on May 8. “We have seen some noteworthy displays of pitching skill within the last fifteen years,” opined the Brooklyn Daily Eagle, “but we never saw such judgment exhibited in the position than in this game.”3 Boston’s strapping 6-foot-1 right-hander, Al Spalding, yielded three hits and two runs in the first inning, then shut down the Mutuals on one hit thereafter in that contest. 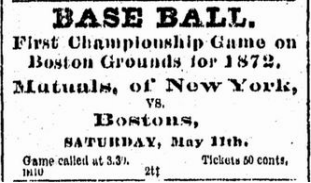 The first professional baseball game of the 1872 season in Boston drew approximately 4,000 spectators — “many of them ladies,” noted the Boston Journal — to the South End Grounds on a springlike Saturday afternoon, May 11.4 The prediction by the Brooklyn Daily Eagle that “baseball will not be so popular this season as last” seemed erroneous when one surveyed the wooden stands filled with a raucous, smartly dressed crowd.5 According to the Boston Post, betting was brisk, with bookies taking 2-1 odds on Boston, despite the Red Stockings’ loss of first baseman Charlie Gould, who had injured his hand in the previous game.6 Gould was replaced by outfielder Fraley Rogers, while 33-year-old utilityman Dave Birdsall took Rogers's place in left field. Harry Wright won the customary coin toss to determine which team would bat first, and chose to take the field. It was a fortuitous decision. At 2:30 umpire E. Chandler, from Boston, called the game to order. From the outset, the game proved to be a duel between two of the best hurlers in the NA, both future Hall of Famers. The 21-year-old Spalding was the most celebrated pitcher in the earliest phase of professional baseball. Spalding led the NA in victories in all five seasons of its existence, including a 38-8 record in 1872. Weighing just 120 pounds, 23-year-old right-hander Candy Cummings is often regarded as the inventor of the curveball. The Massachusetts native baffled batters with that pitch as a member of the amateur Brooklyn Stars (1869-1871) before joining the Mutuals, for whom he won 33 games and led the league with 497 innings pitched in 1872. After each team managed just one baserunner in the first two frames, Boston rallied in the third when George Wright, the manager’s brother, reached first. He scored on a double by Ross Barnes, arguably the most dangerous hitter in the NA. Barnes paced the circuit in batting in 1872 (.430) and 1873 (.431), and finished with the highest career mark in the five-year existence of the league (.391). The right-handed hitter was also the unequivocal master of the “fair-foul” hit whereby he struck the ball in such a manner that it hit in fair territory in front of the third baseman before rolling into foul territory. The Mutuals finally solved Spalding in the fifth when Cummings led off with a double and scored on George Bechtel’s single. Bechtel subsequently stole second base and scored on rugged Nat Hicks’s one-out single. When John McMullin followed with one of his team-leading 11 walks for the season, the Mutuals seemed to have Spalding on the ropes. The game’s momentum took a quick and unexpected turn when John Hatfield hit a routine popup to shortstop George Wright. But with runners on first and second, the crafty infielder apparently let the ball purposely fall out of his glove. He quickly retrieved the orb, rifled a shot to third baseman Harry Schafer, who forced Hicks; Schafer threw to second baseman Barnes to complete the inning-ending double play. “[I]t was done so quick,” reported the Boston Post, “that Dickey Pearce began to ‘chin’ with the umpire.”7 The Boston Journal noted that the sequence of events “occasioned some talk between umpire and the captains of the rival nines, but it was allowed to pass as a muffed fly.”8 [The National League instituted the infield-fly rule in 1895 to prohibit such intentional drops, which had become commonplace by then]. Stymied by Cummings since the third inning, Boston mounted a rally in the eighth. George Wright got a one-out hit, and subsequently scampered to third on Andy Leonard’s two-out single. Leonard stole second, giving Cal McVey a chance to be a hero. Often overlooked on a squad that featured the Wright brothers, Barnes, Spalding, and (beginning in 1873) Deacon White, McVey was a dangerous hitter, finishing second in batting average (.431) and RBIs (43) in 1871, and twice leading the NA in RBIs (1874-1875). But this time McVey hit an inning-ending grounder to third baseman Pearce. Spalding set down the “Mutes,” so called by the Boston Journal, in the ninth. George Wright made a fine defensive play for the second out when he corralled Cummings’ hot grounder after it got by third baseman Schafer, and heaved to first. Tension mounted again in the ninth. “When Boston went to bat for the last time,” wrote the World Telegraph, “the feeling was that they were defeated, but never was the glorious uncertainty of the game more manifested.”9 Spalding stepped to the box to lead things off. No one-trick pony, Spalding was a bona-fide hitter; his 47 RBIs led the team in ’72, and his .354 batting average trailed only Barnes. At the plate with Spalding stood Barnes, who was serving for this at-bat as a designated runner — an accepted custom at the time. Spalding sent a ball sailing down the left-field line. According to the Boston Journal, Barnes had made it around second base before noticing that the ball was foul, and returned to the plate.10 Playing it cautious, Cummings walked Spalding, a mistake that proved fatal with the pitcher’s designated runner on the basepaths. Barnes immediately stole second and third. Birdsall hit a “daisy-cutter” to right field to drive in Barnes and tie the game.11 The next batter, Harry Schafer, smashed a double to deep left field. Birdsall raced around the bases to score the winning run, sending the partisan crowd into a frenzy. “The spectators seemed fairly wild,” read one report about the excitement, “shouting for minutes, and throwing their hats in the air.”12 But in then-customary fashion, the teams kept playing until all 27 outs were recorded, even though the outcome had been decided. After Cummings dispatched Rogers, Harry Wright lined a single past the shortstop to drive in Schafer for the final run in the 4-2 victory. Reports about the game focused on the excellent pitching and fielding. “Spalding sent in the balls very hot,” wrote the Boston Post about the Red Stockings ace, who surrendered only five hits and issued one walk.13 Since losing to the Athletics, Spalding had squashed opponents, permitting just 14 hits in his previous 31 innings. Cummings pitched almost as well, giving up eight hits and two walks, in a game that last 1 hour and 45 minutes. Boston continued its juggernaut after the dramatic victory, extending its winning streak to 19 games before suffering a home loss to the Haymakers of Troy, New York, on July 20. The Red Stockings finished the season with a 39-8 record to capture their first of four consecutive NA titles. 1 Boston Daily Evening Transcript, May 13, 1872: 4. 2 “Base Ball — Red Stockings vs Mutuals — A Brilliant Victory for Boston — Cricket — Harvard vs Boston, etc,” Boston Post, May 13, 1872: 4. 3 “Sports and Pastimes. Base Ball,” Brooklyn Daily Eagle, May 9, 1872: 3. 4 “Extraordinary Game Between the Bostons and Mutuals of New York Saturday — Brilliant Victory of the Red Stockings — Score 4-2,” Boston Journal, May 13, 1872: 1. 5 “Miscellaneous News,” Brooklyn Daily Eagle, May 11, 1872: 1. 9 World Telegraph quoted from “The Mutual Defeat in Boston,” Brooklyn Daily Eagle, May 13, 1872: 2. 16 Chuck Rosciam, “The Evolution of Catcher's Equipment,” SABR Baseball Research Journal, Summer 2010. https://sabr.org/research/evolution-catchers-equipment.